Following on from Almonacid, though several months later, the final battle in this series and historically a disastrous Spanish defeat. For the Day of Battle we find eight Infantry Divisions and one Cavalry Division of the Spanish Army under Areizaga lined up from Noblejas in the north to Ocana in the south. Ocana itself is protected by a stream with steep banks, north nothing much, other than olive groves, breaks the landscape. The French, IV Corps under Sebastiani, V Corps under Mortier, the Guard under Joseph and 3 Cavalry under Milhaud are all commanded by Soult. Joseph opens the fight with an attack on the Vanguard artillery in front of Ocana, driving them into the stream. The rest of the French army makes no move. Freire’s Spanish cavalry attack Mihaud’s, forcing then back and cutting down Milhaud himself. The French then attack along the line. It is a hard struggle. To the south the Spanish Vanguard eliminates the French Guard cavalry and along with 2 Division push back the French Guard. To the north the Spanish line is slowly pushed back and casualties accumulate, particularly 1st Division which is cut off and destroyed. The French cavalry take some time to get going, both as a result of the loss of their commander and the resistance from Osorio’s cavalry, which isolated behind French lines, held out for four hours. As evening comes on the French cavalry kill Zerain, the 5th Division Commander and finally eliminate the Spanish cavalry – but too late to encircle the Spanish army as night falls. 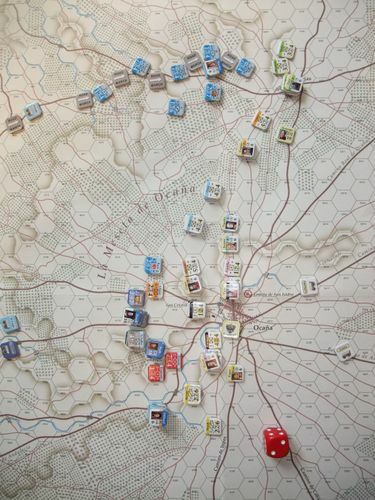 The French lost 13 SP, the Spanish 33 SP and three division’s demoralised. 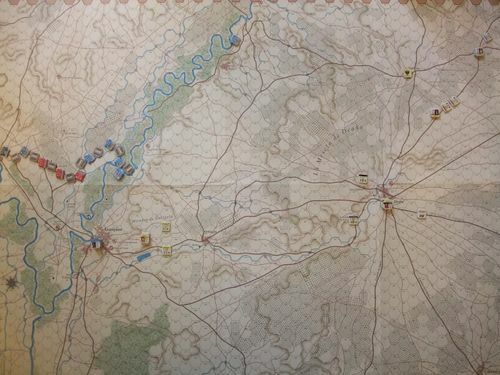 With VP locations and card VP being equal it was a 17:7 French Strategic Victory, but not the rout Almonacid was; most of the Spanish army is intact and should be able to retire overnight. 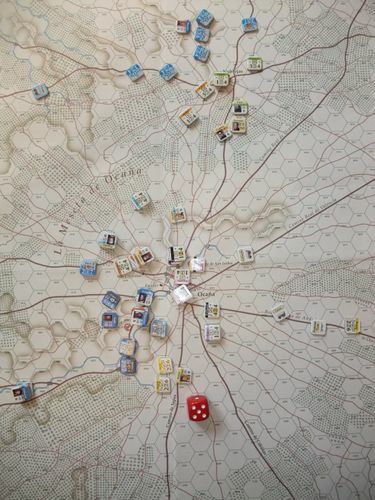 The Approach to Battle sees the French arriving and taking a circuitous route. As the bridge at Aranjuez is still destroyed so they have to cross at the Puenta de la Reina; the pontoon trains are with the King and so back in the march order. 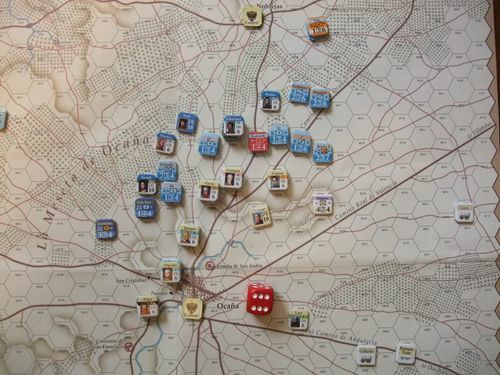 The Spanish have the Vanguard at Ocana and Freire’s cavalry in front of Aranjuez, the rest of the Spanish are en route. The French have problems with lack of fodder for the cavalry, reducing their speed, 1st Division of V Corps being delayed by bad guides and IV Corps held up by badly drafted orders. But as the French crawl down the trails and over the bridge Sebastiani, Milhaud and the French cavalry scatter the Spanish while Freire barely reacts. Overnight IV Corps continues to march towards Ocana while V Corps marches to Noblejas. The next day sees more marching until by 2pm IV Corps is in position at Ocana. 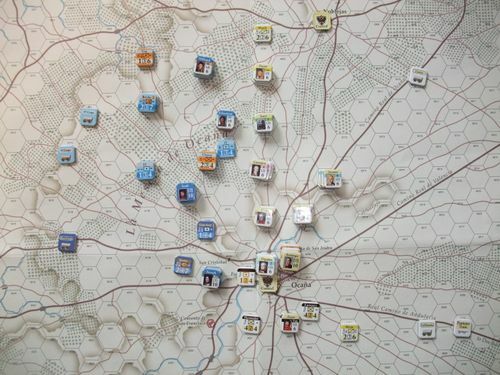 Areizaga has sent 1 and 7 Divisions to Noblejas, 2 and 6 cover the country between there and Ocana where the rest of the army is concentrated, with the cavalry to the south. In the north Mortier moved slowly, it is only before nightfall he attacks and swiftly takes Nobeljas. With the loss of both towns, his army weakened, and the French cavalry returning in the south Areizaga declares a general retreat. Losses were relatively light – French 6SP, Spanish 12 SP. But with both towns taken and the Spanish army in retreat it was another French strategic victory (24:7 VP), but a hard won one. That was not quite what I had expected. Admittedly the French cavalry performed badly, for different reasons, in both games. And the Spanish army is tough – some strong units, an advantage in shock combat and some decent sized cavalry under one command. But it was not the historical rout I expected. So only the Talavera Approach to Battle to try out. But my wife is away for a week, I am home dog sitting and so can take over dining room where there is plenty space for the 75” of maps for the Grand Campaign for Napoleon's Last Gamble.